It’s no secret that Paris is a perfect city for flâneurs. With treasures to be discovered around every turn, the French capital is a city that’s meant to be strolled. But what are the best walking circuits? Readers often ask for some expert tips, and here we’re happy to share the recommendations of our contributors. One of my favorite walks in Paris is the rue des Cascades in Belleville. If you start at the rue de Ménilmontant side of the rue des Cascades, you’ll glimpse as you go three small house-like regards or manholes (at 17, 41, and 42 rue des Cascades). The street is named for these, since inside each building are the cascades of water that were formerly channeled from Belleville down to the center of Paris. The regards were built in the time of Philippe-Auguste, when the first market at Les Halles was established. Philippe-Auguste’s plans for the central marketplace included ordinary Parisians being able to access clean drinking water that came straight from Belleville by way of the Fontaine des Innocents. At number 44, you’ll find the house and garden of Casque d’Or, a turn-of-the-last-century gangster. When Jacques Becker shot his 1952 film Casque d’Or, starring Simone Signoret and Serge Reggiani, he filmed on location at the house. 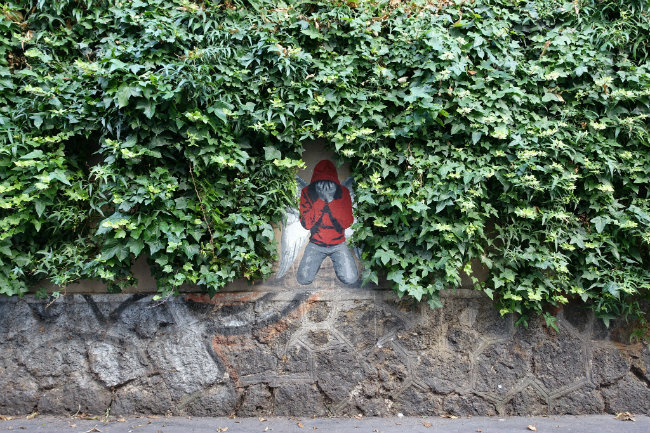 Besides soaking up the street’s picturesque old-Paris charm, you can also get an eyeful during the Artist’s Open Studios at the end of May: you’ll get to wander in and out of the buildings and see where artists create their works. 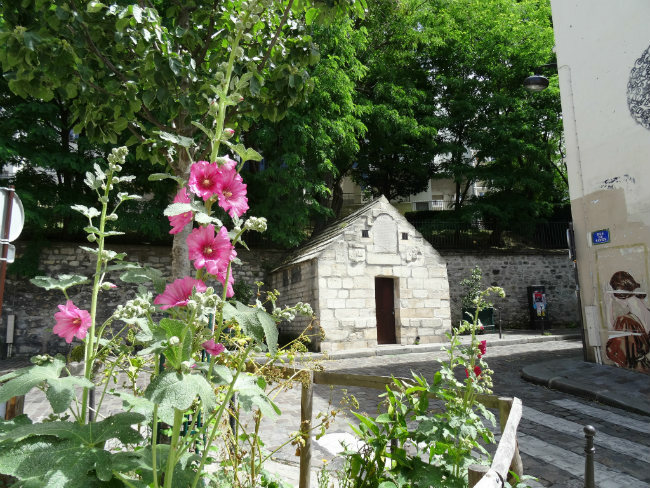 When you reach place Henri Place Henri-Krasucki, take the rue des Envierges – a beautiful surprise awaits you at the end of the street! 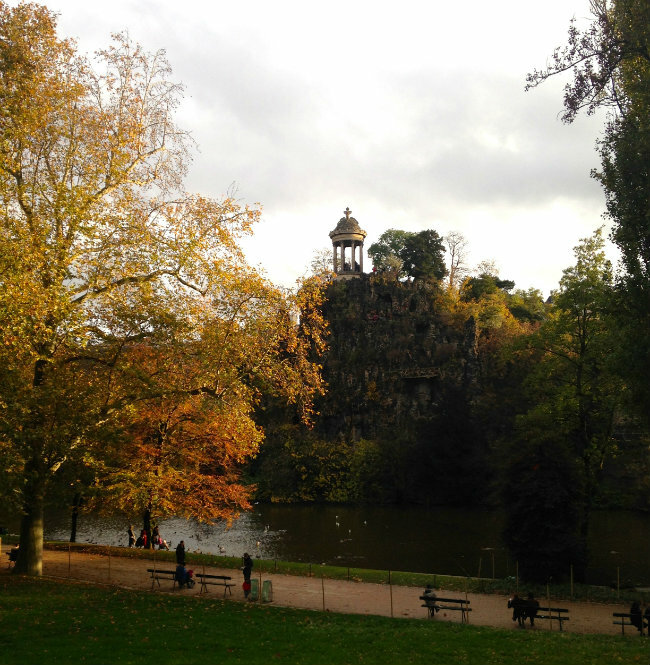 When I lived in the 19th arrondissement years ago, I would spend hours discovering all the corners of Parc des Buttes-Chaumont– the grottos, the hillside paths, the “lakeside” circuit and of course the temple perched atop the butte. Even in the snow I would head out for some fresh air in this wonderfully verdant space, often continuing down avenue Secrétan, an old market street, until I reached the Canal Saint-Martin. 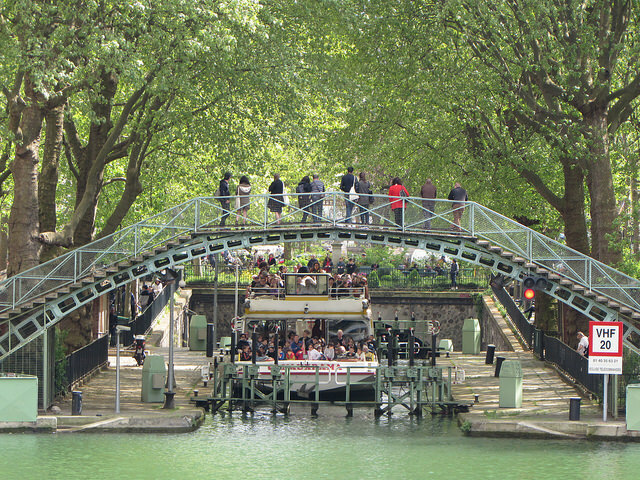 This is, in fact, a fabulous stroll: Continue past the Point Éphémère– a hot spot for art exhibits and concerts– and you’ll come to a bend in the canal bordered by the colorful facades of the Antoine et Lili boutiques. This area is hipster heaven. (I used to love dinners at Hotel du Nord, and browsing the art books at Artazart. Now there are dozens of interesting cafés and hang-outs.) At Chez Prune, I’d veer off on Rue Beaurepaire– filled with cool clothing shops– towards République. If I were feeling particularly energetic, I’d continue into the Upper Marais, ending up at the wonderful covered market that is the Marché des Enfants-Rouges. — Mary Winston Nicklin is the Editor of Bonjour Paris. There are many wonderful urban walks for the Parisian flâneur, but sometimes one needs a walk on the green side. 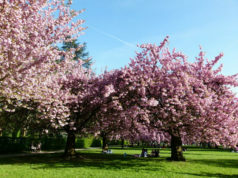 The manicured gardens like Tuileries and Luxembourg just don’t cut it, and the green expanses of the Bois de Boulogne and Bois de Vincennes are more for hiking (or running) than walking. Living in the otherwise gloriously nondescript 12th arrondissement, I’m grateful for the Vincennes Wood but also for a lesser known ambulatory venue, the Promenade Plantée (aka Coulée Verte). The Promenade is essentially a path or walkway built along old railway lines that used to run through the district. It begins at the Bastille and runs nearly to the end of the 12th, where it meets the suburb of Saint-Mandé. 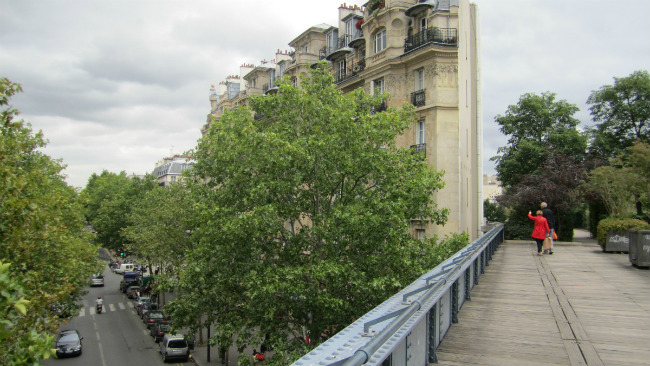 Parts of it are relatively narrow but much is wide and contains parallel paths—one for walking, the other for bikes, rollers, and skateboards. All of it is lined with greenery, trees, bushes, and flowers. On a sunny Sunday it’s the perfect antidote to the urban cafard. — Dimitri Keramitas is a writer (film critic, fiction) and the director of the creative writing program at WICE, a Paris-based organization. I’m not much of a walker. Growing up in the middle of nowhere meant that my old racing bike became an extension of my own body; my trusty, rusty steed carrying me away from boredom with gay abandon. When I’m in Paris, try as I may to embrace the life of a flâneur, these old swift habits die hard, and I usually reach for the nearest Vélib’ rent bike to avoid the slow plod of foot on concrete. Running, however, is in my opinion the perfect mode for exploring a city. The fast pace caters for my short attention span and given my terrible sense of direction I can say with certainty that I will get lost, follow dead-ends and discover wicked new places. I’ll never be able to find them again of course, but sometimes it’s nice to maintain a light shrouding of mystery in Paris, especially in an age where smart phones have all but obliterated the anticipation of what’s around the next corner, replacing the fun with military-grade pinpoint accuracy and the shrill little voice of Siri telling us to make a u-turn. Running in Paris is in fact a delight, with so many parks to choose from its easy to get off-road. My personal favorite route begins from my base in the 13th, heading north up to the beautiful Jardin des Plantes. Here you can run/jog/stroll the pristinely manicured garden path surrounded by interesting and exotic plants. Also, and perhaps more importantly to the amateur running enthusiast, this path is a perfect one kilometer loop and therefore perfect for training! Stop off in the Grande Mosquée de Paris situated round the back of the park for a refreshing mint tea. You are permitted to walk home after that. — Theo Gittens is a freelance writer/editor for Bonjour Paris and France Today. Calling all Instagram Aficionados: This autumn time grid tip is for you. The Jardin des Tuileries is the perfect backdrop for your photo-op. 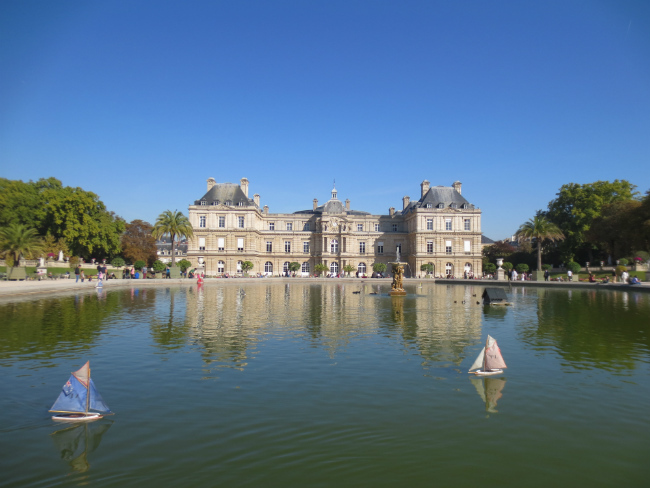 Conceived with a slight Italian flair by Queen Catherine de Médici in 1564, the Tuileries was given a redo by landscape architect André Le Nôtre during the Sun King’s reign. After the Big Wigs’ big move to Versailles, it became one of the first public parks. A golden oldie still, here fall foliage is your O.O.T.D. 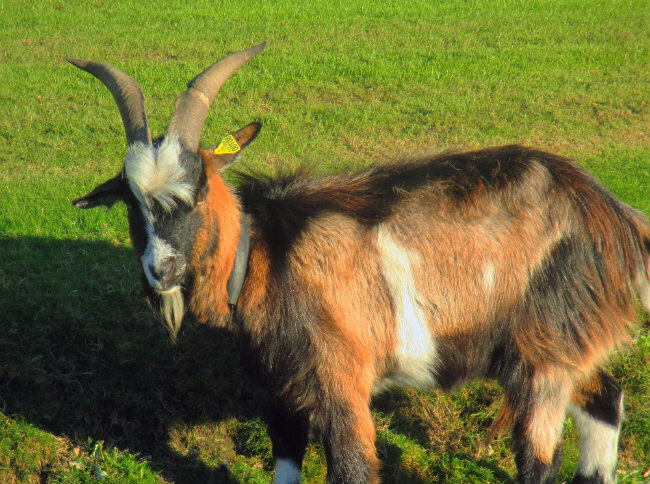 friend, so why not shake up the scene with a red trench coat? 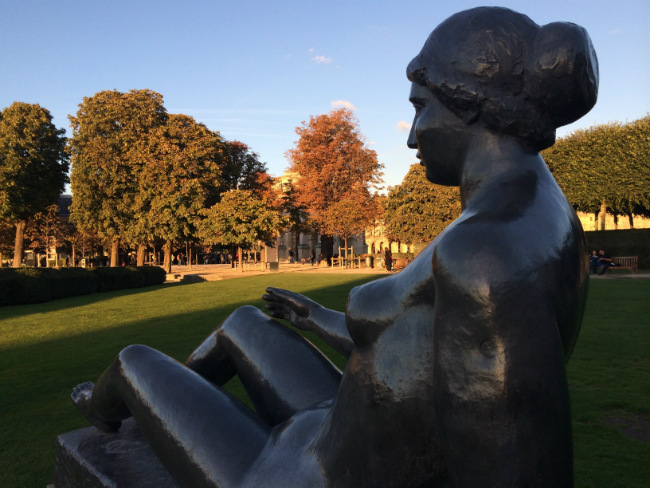 Your eye will spy: flowerbeds, shady trees, views of the Eiffel Tower, and a statuesque squad of eighteen bronzes by Aristide Maillol. 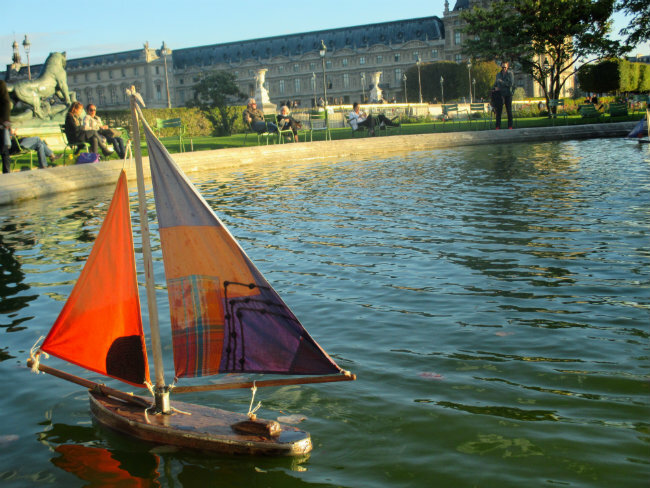 As if that’s not enough, there are miniature sailboats, regal statues, and grazing goats. 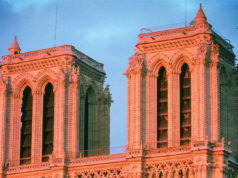 — Theadora Brack is a Paris-based writer who has a regular column, called “My Life in Paris,” in France Today magazine. — Nicola Leigh Stewart is a lifestyle journalist who after living in London and Madrid has finally settled in Paris. — Janet Hulstrand is a writer, editor and teacher based in Essoyes, a beautiful little village in the Champagne region. I never tire of walking around Paris, particularly the neighborhoods that compose the Marais. 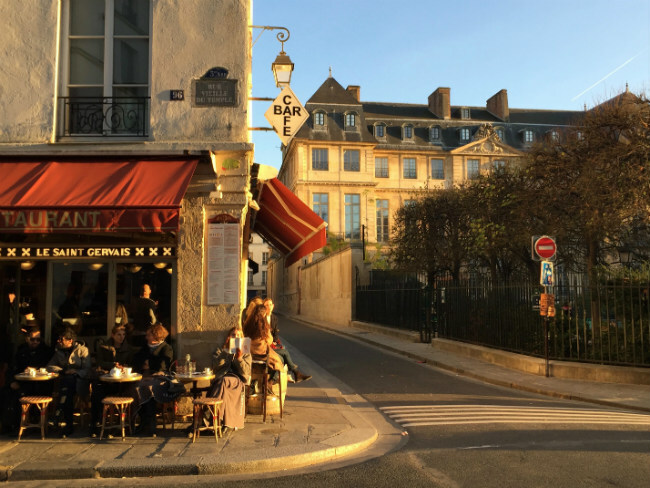 My favorite route is along rue Charlot, passing many of the independent boutiques I know and love, and coffee shops worth stopping in for a cafe crème. Once I reach rue de Bretagne, the main artery of the North Marais, I turn right into rue Vieille du Temple where I smile each time I pass the newly renovated Picasso Museum. This lengthy street leads to the winding alleys of the historic Marais, lined with designer boutiques, Jewish eateries and sweets shops. Well manicured gardens too are plentiful, offering a place of repose and reflection. I can easily spend hours meandering these right bank streets, discovering all the wonders hidden within them. — Kasia Dietz is a handbag designer and freelance writer originally from New York. — Anne McCarthy is a freelance writer who regularly contributes to Bonjour Paris. Since selling my car everyday in Paris is my favorite walk! The perfect way to discover hidden courtyards, a new bistro is to be a flâneur – bringing out my inner Baudelaire. Sundays I’ll take the metro to Clignancourt (line 4), walk past the fake handbags and belts and the “you want to buy watch/telephone/my sister/video pedlars” to the flea market – Les Puces de Saint Ouen. 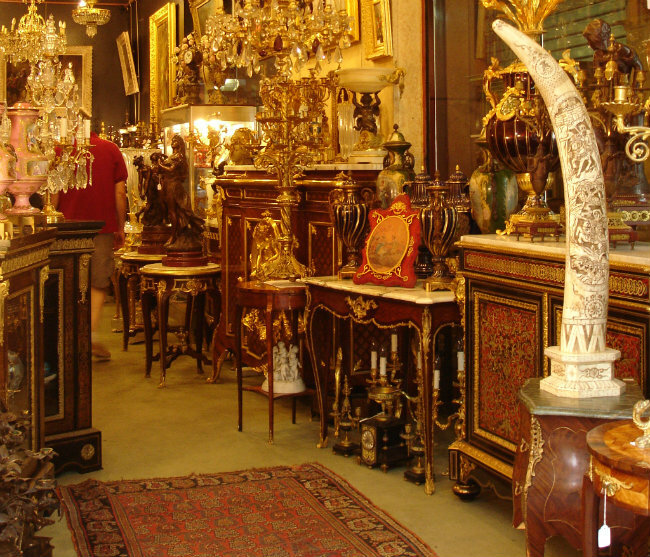 I begin at rue des Rosiers making a bucket list of furniture, furs, jewelry. Then it’s time for a strong espresso at No. 122 – this eccentric space is dedicated to Django Rheinhardt – musicians play and people party at all hours – eat as well. Great place to make NBFs! 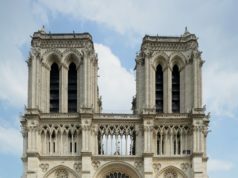 I continue without a plan, ducking and diving through the covered markets which often have remarkable art and sculpture exhibitions– everyone chats freely which is not always the case in Paris. Lunch could be in any one of the cafés or at the Starck-designed Mes Cocottes or the exciting, recently opened MOB hotel, on the terrace. There’s a hip new Greek bistro YaYa, I haven’t tried it yet – maybe next Sunday… See you there! — Margaret Kemp is a regular contributor to Bonjour Paris and Financial Times How to Spend It. The Jardin du Palais-Royal is perfect for a relaxing daytime stroll. Walk along the shopping arcades, grab a cup of coffee at Cafe Kitsuné, and have a seat in the tranquil garden. Explore the surrounding areas as well, including the elegant Galerie Vivienne (one of the city’s historic covered passages) and the charming Place des Petits-Pères. From there, walk through the Place des Victoires on your way to rue Montorgueil, a vibrant pedestrian street with cafes, bakeries, and much more for the hungry flâneur. — Rohini Gupta is an American writer and editor based in Paris and San Francisco. My favorite walk begins at Rue de Seine and Rue Jacob in Saint-Germain-des-Prés. I lived for a while on Rue Jacob and it remains one of my favorite streets in all of Paris. 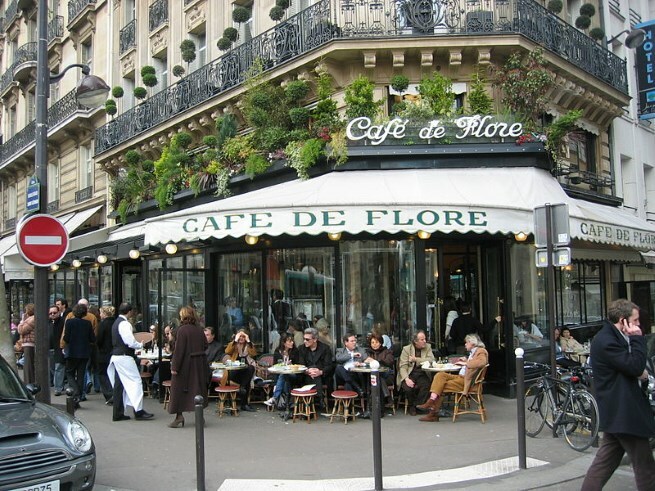 The street is filled with boutiques, art galleries and antiques shops, typical of the 6th arrondissement . At 14 Rue Jacob, composer Richard Wagner lived. Just past Rue Bonaparte is Hotel d’Angleterre. It was in room 14 that Ernest Hemingway and Hadley stayed on their first night in Paris. At the corner of Rue des Saints-Pères and Rue Jacob, the Treaty of Paris was signed on September 3, 1783, which gave the United States independence from Great Britain. Cross Rue des Saints-Pères and Rue Jacob turns to Rue de l’Université and from the 6th to the 7th arrondissement. The prestigious street is home to a plethora of maisons particulières. The lengthy stretch runs a few blocks off, but parallel with the Seine, crosses Boulevard Saint-Germain and runs behind Assemblée Nationale. 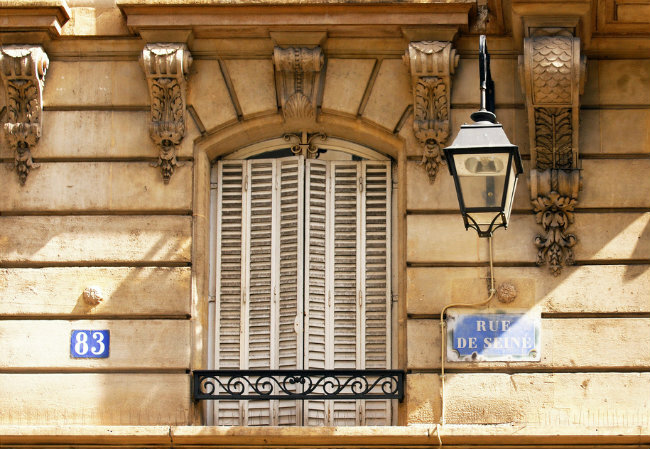 Julia Child learned to cook while at 81 Rue de l’Université, close to Palais Bourbon. Keep walking and the street opens up to L’esplanade des Invalides. Look to the left and Napoleon’s golden tomb shines, while to the right is Pont Alexandre III. A bit further, cross Avenues Bosquet and Rapp, before Rue de l’Université dead-ends at the Champ de Mars and the Eiffel Tower. Each time I take this walk I discover something new, whether it’s an architectural detail or a historical plaque tucked away on the side of a building. — Leah Walker is a luxury travel and food writer. My favorite walk in Paris? I could say: From my studio in Rue de Buci, I walk up rue de l’Ancienne-Comédie, cross Blvd St Germain and continue up Rue de l’Odéon, redolent with memories of Sylvia Beach’s bookshop, Shakespeare and Company, and past the Odéon Theatre to the wrought iron fence that surrounds the inimitable Luxembourg Gardens. But that is just a stroll– 10 minutes tops, so much as I love it, I’ve had to choose a destination a little further away: St Germain to the Musée d’Orsay. The easy route would be to walk almost the length of Blvd St Germain, but that would deprive you of all the unchanged, narrow streets, rich in character that Haussmann spared. From Rue de Buci with its daily market turn right into Rue de Seine then left into Rue Jacob. Rue Jacob is packed with antique and interior design shops, classy hotels behind intriguing courtyards, and the beautiful Place de Furstemberg off to the left. Turning right into Rue des Saints-Pères and left into Rue de Verneuil brings you past the graffittied home of Serge Gainsbourg, left exactly as it was when he died more than 20 years ago. Rue de Poitiers leads to the Rue de Lille and the back of the Musée d’Orsay. 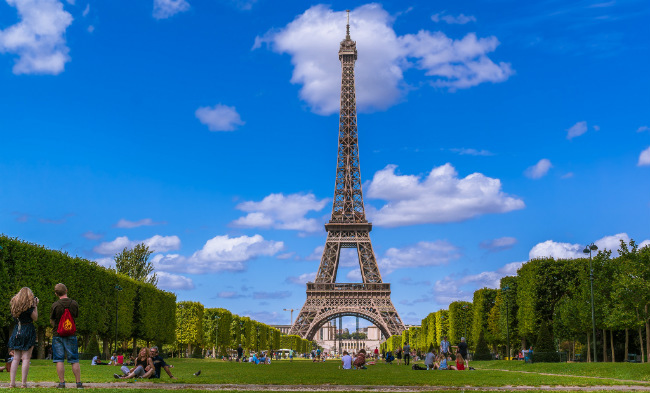 The Orsay’s iconic architecture is best viewed from the quai opposite from whence you can start your return journey, following the Seine and browsing the bouquinistes all the way back to Pont Neuf, Rue Dauphine and Rue de Buci. Previous articleCan a Michelin 3-Star Chef Renounce his Stars ?